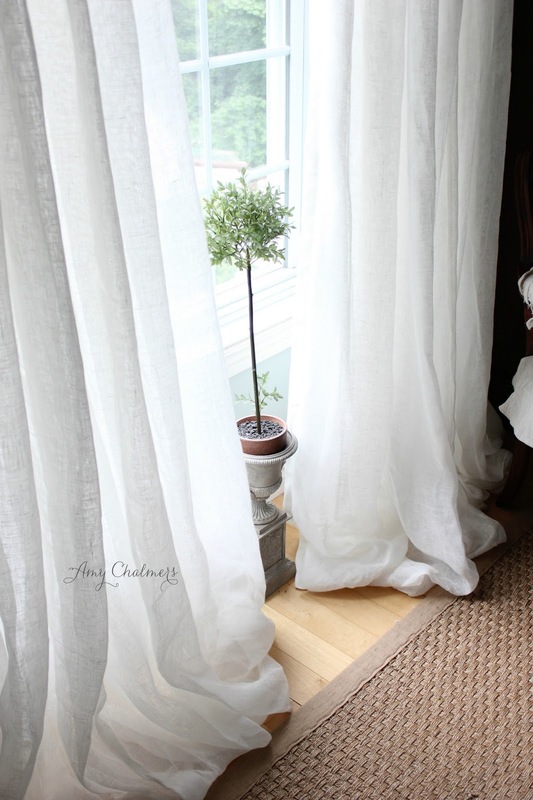 Romantic and luscious, these Linen Balloon Drapery Panels are gorgeous! 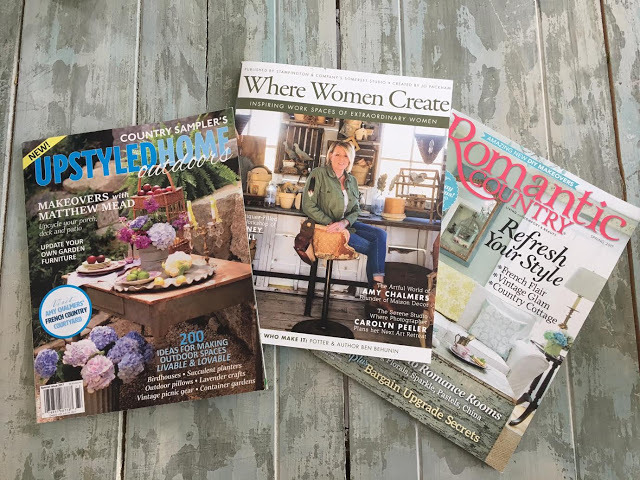 wonderful for their European and French home decor offerings. 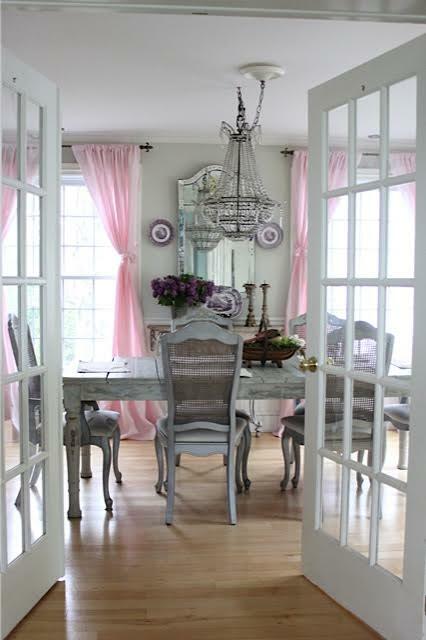 I was delighted to partner up with them again on these beautiful window treatments. 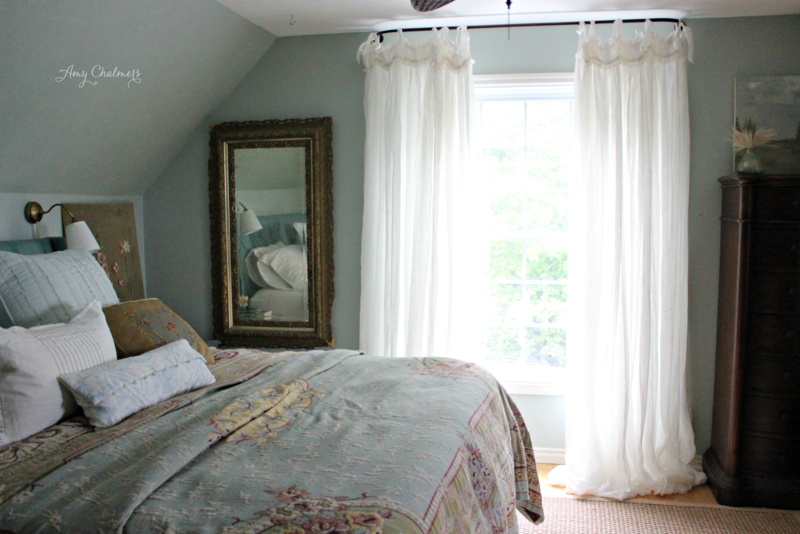 but I really had my heart set on these linen panels for our bedroom. The panels are lined in white cotton which gives it extra weight and fullness. The bottoms of the panels are sewn back onto the lining and it creates a balloon effect. which feels like the essence of European glamour. The color of my panels is ivory. 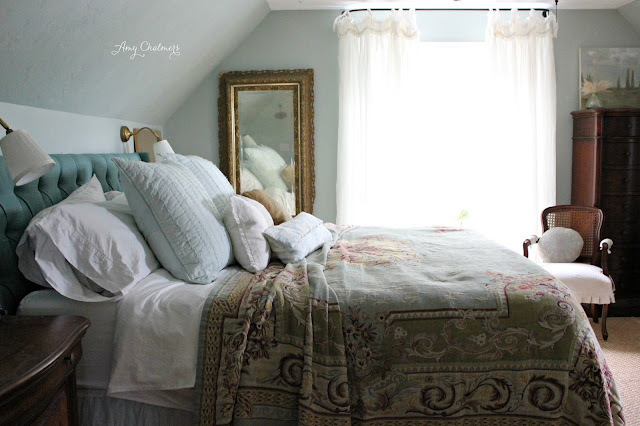 The ivory is very soft, off white, not yellowy, and it looks nice with the white bedding. The panels do come in white, but I was afraid it may be too white, so I opted for ivory. Can I say......I am in LOVE! 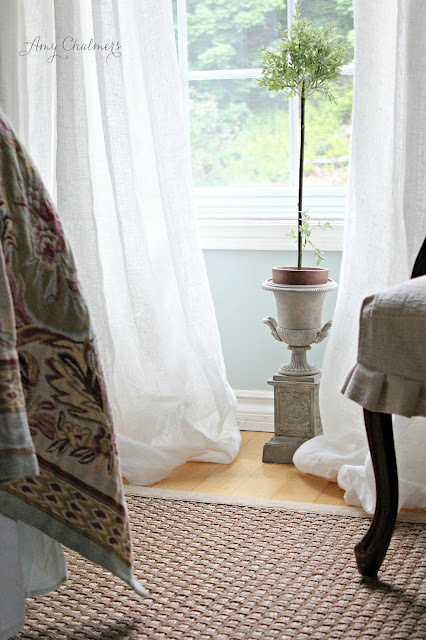 The gauzy ivory linen with the white cotton lining sits elegantly on the floor. 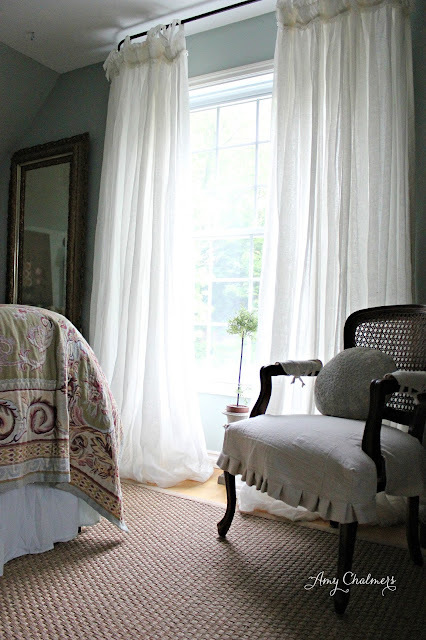 these curtains more highly~they are beautifully made and look incredible! looked up at the window and said, "Wow, these look very grand!" one of my favorite improvements in adding to the overall ambience of the room. heiress, with many mansions that she kept up, but never visited. Bizarre! 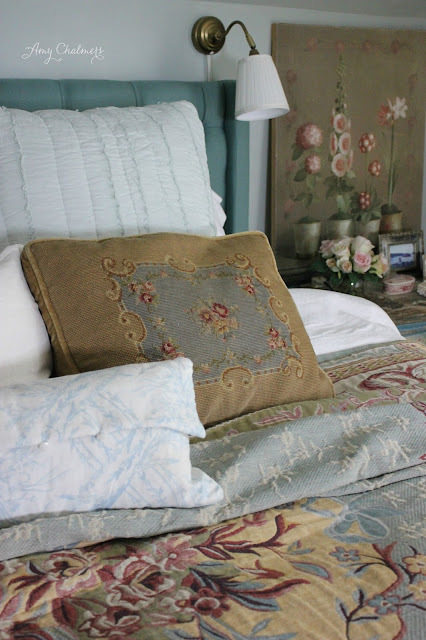 something similar in her bedrooms~she was born in France, after all. the tufted blue headboard, and last but not least, the Linen Balloon Panels!! into the space of the room, and that is why I think hubby thought they looked grand. Its an understated wow kind of look! Simply put, these panels are wonderful! and it only took ten minutes for me to do both panels. bookcases was a thought that struck me just this morning. Why had I never bothered to take a measurement and see if this would work? 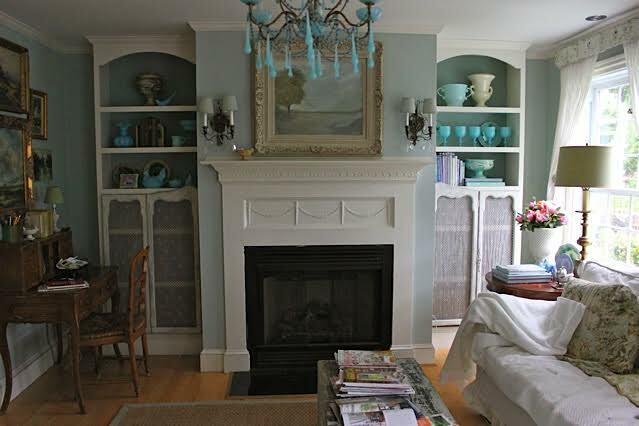 busy looking bookcases with shutters or custom doors. 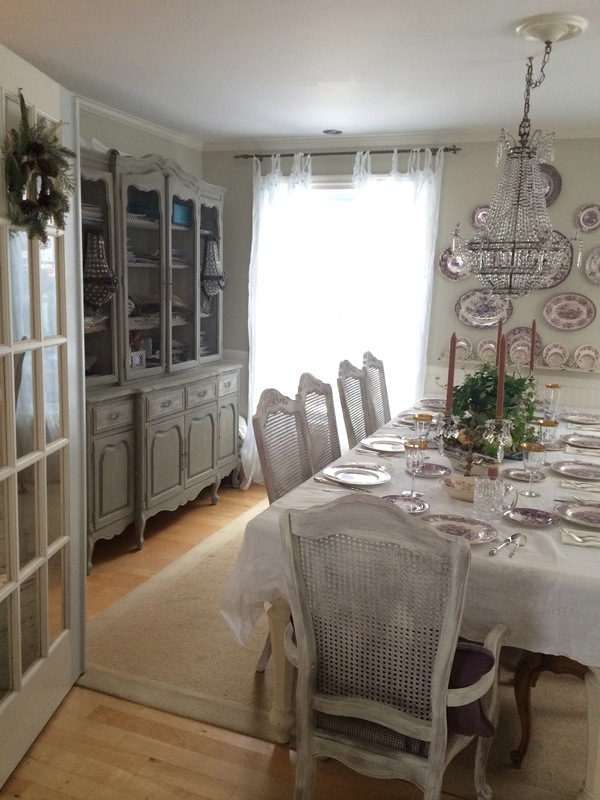 (Here is an old photo of the french provincial dining room cabinet. 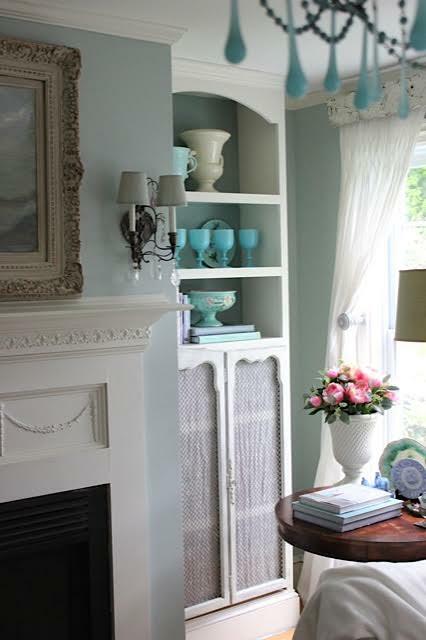 grates for that extra frenchy look, and a fleur de lis linen sheer to hide the contents. The living room bookshelves, sans doors. 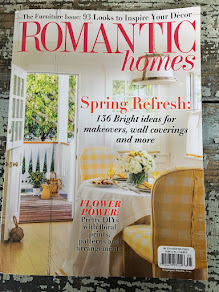 This is the beauty shot that was just featured in Romantic Country magazine. 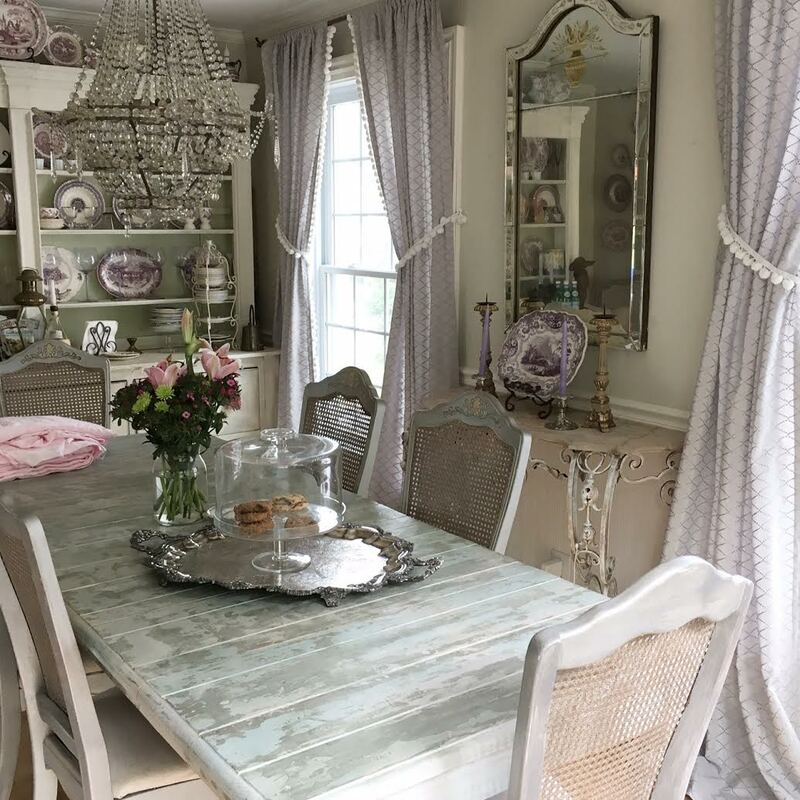 Fifi O'Neill styled it to look absolutely wonderful. top three open for pretty displays. and in its place I put my writing desk. After the desk moved into this spot, the bookcase was more annoying than ever. 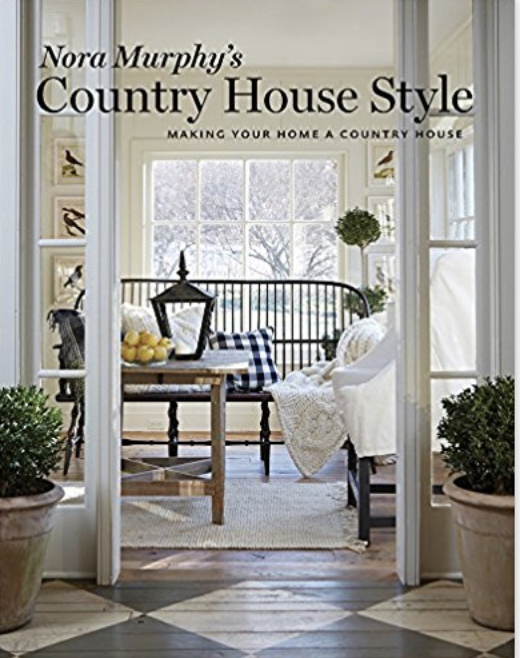 and articles on how to style and arrange items on bookcases because they are annoying. 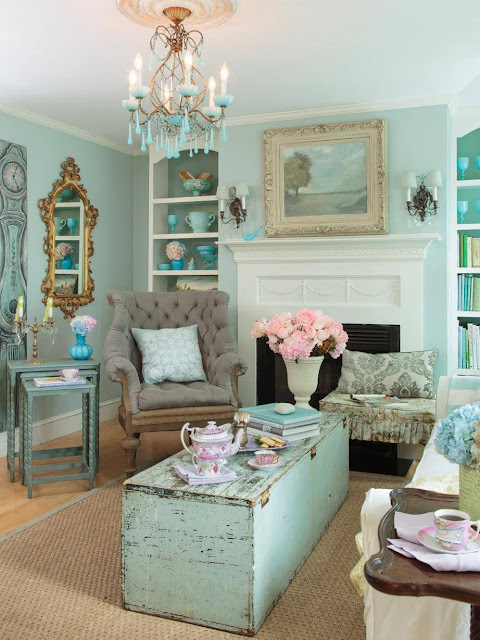 They look messy, busy, cluttered...and I had to agree. and that is how adding doors became paramount (in my mind). 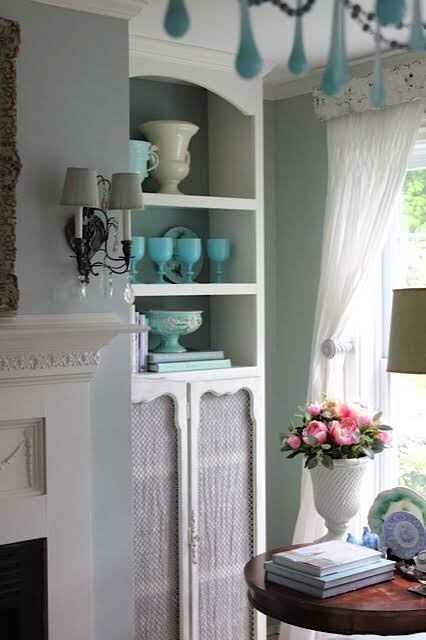 consider recycling old cabinet doors and place them over the shelves using the same hinges. The hinges worked perfectly, but I had to reverse the direction of them. a rainy day project that has me quite pleased. curtain panels I made for the dining room. I apologize. Believe it or not, they only stayed up for 48 hours. reincarnated into some divine project I am sure. 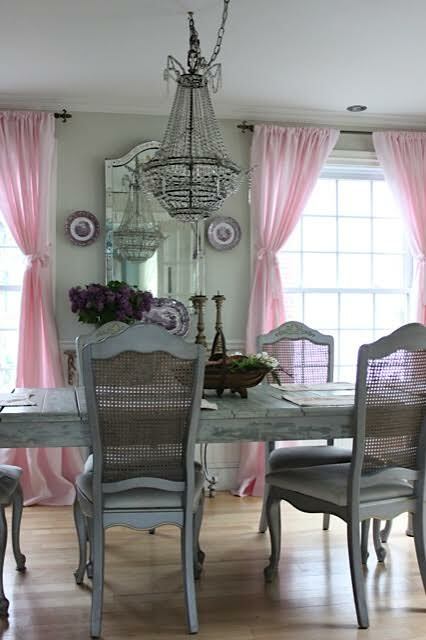 And the grey curtains with the pom poms are back up! 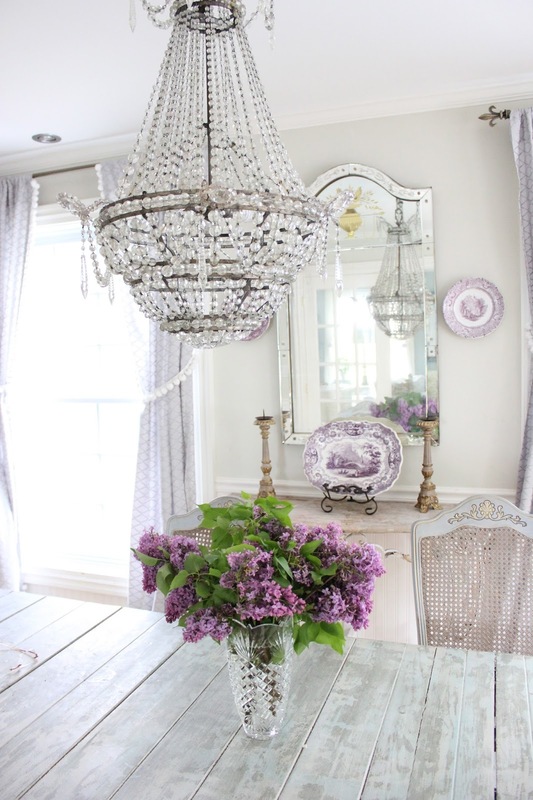 which is kind of funny~he said they really brightened the room. My youngest son Colin detested them. And so did I.
and I was able to use the courtyard for the first time entertaining a crowd! 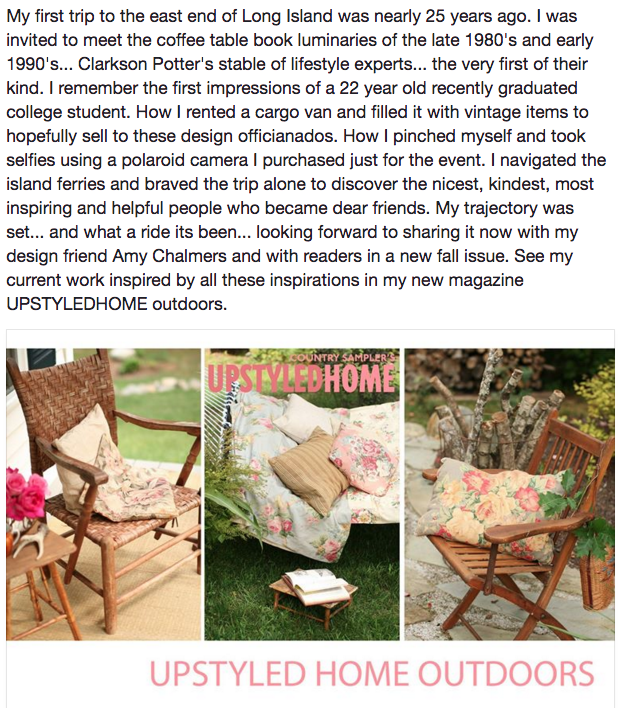 the reviews of it being comfortable and well made, and I am happy to report it is both! 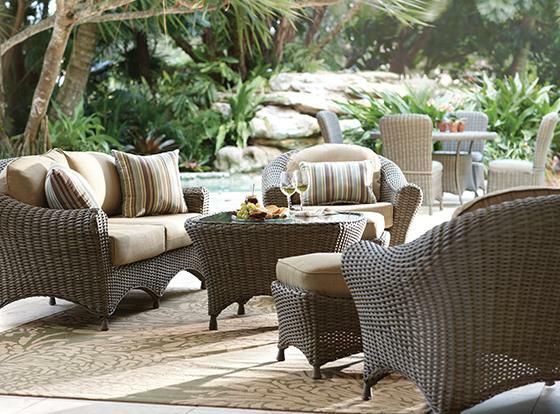 The Adela Lake Collection set by Martha Stewart. 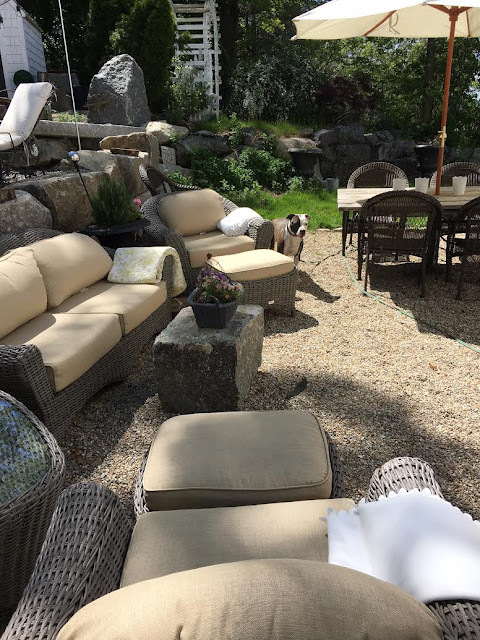 and the daybed was moved opposite the wicker set, so we can seat quite a few people now. which is not installed yet because we are still using the fireplace indoors on cool mornings. we anchor in various spots, controlling where he can hang around. We will be spending a lot of time outdoors in this space, and it was worth the expense. and the HD people gave me a credit for the sale price, which was awesome. 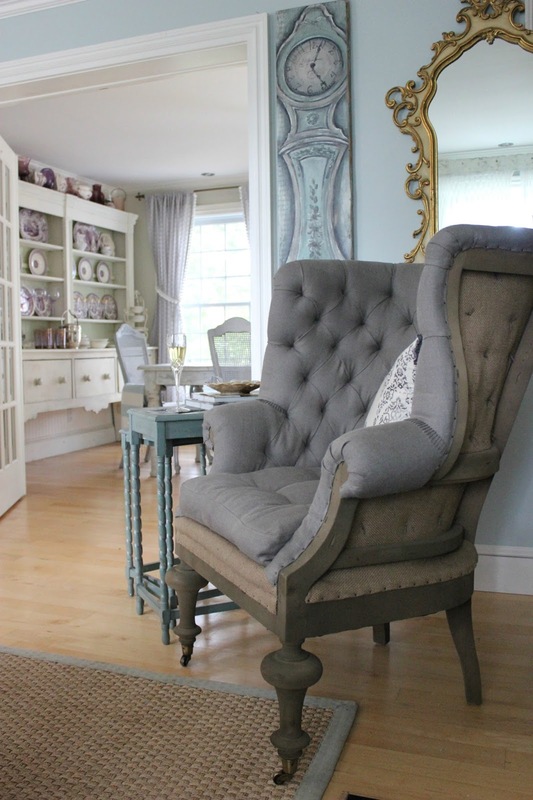 choosing to add accents with throw pillows in Sunbrella. much that he wanted to shoot it, nor did I think it would ever grace a magazine cover! is hoisted through the air from my mother-in-laws back yard to ours (we are neighbors). fabulous. Its inspiring, even to me, and I did the dang thing!! 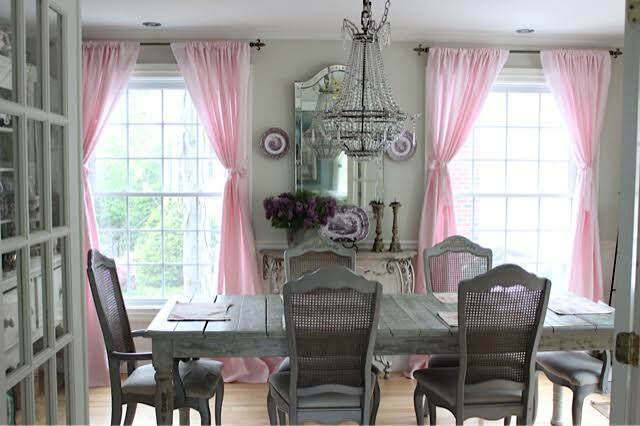 Perhaps I have been swayed by the popularity of blush pink in interiors this year. was too much to ignore. yet simply hung with a straight stitched rod pocket and hemline. and I was lucky enough to have one at the age of 12. 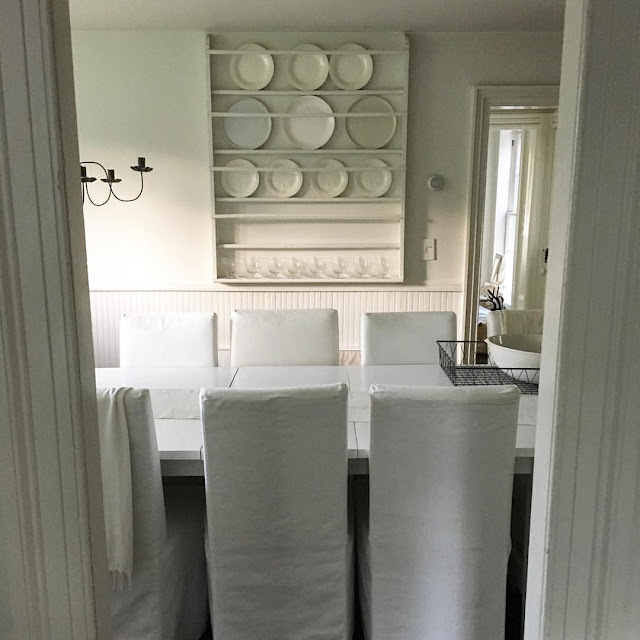 We eat dinner in this room every night as a family, and most often we dine on placemats instead of a table cloth, as placemats are easier to launder. 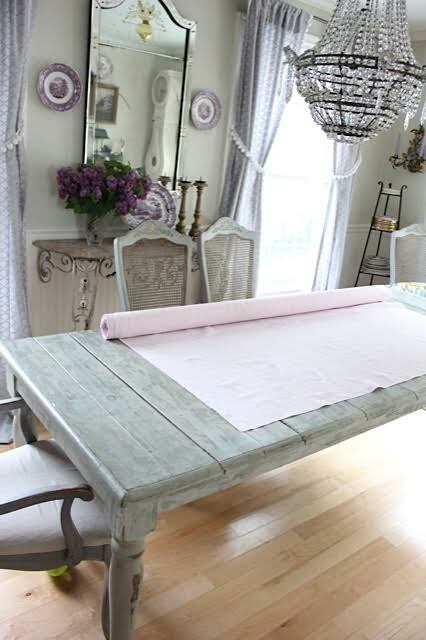 I made a set of pink toile placemats about twelve years ago and they have stood up so well over time and repeated washings. 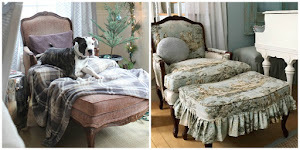 Sewing can really come in handy when you want specific styles in draperies, pillows, placemats, napkins and the like. Sewing gives me the ability to showoff my personal style, and I won't see it anywhere else. A pair of antique gilded candlesticks from my blogging friend Cindy at Edith + Evelyn Vintage's etsy shop grace the French console. 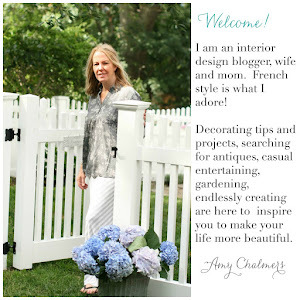 She has many french accessories in her online shop. 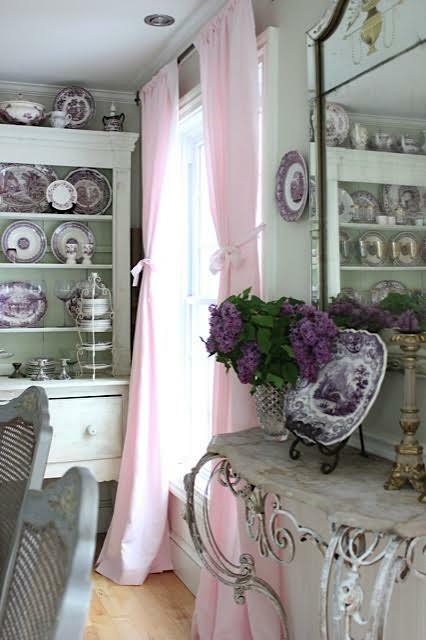 I traded the candlesticks for some of my purple transferware with Cindy, which was really fun. 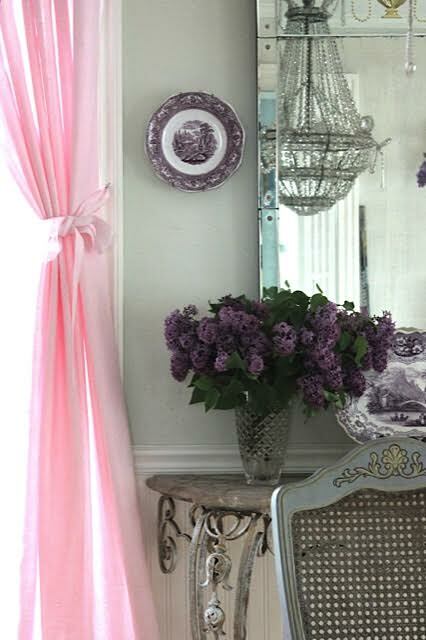 I am looking forward to seeing my old plates gracing her beautiful French home on her blog. 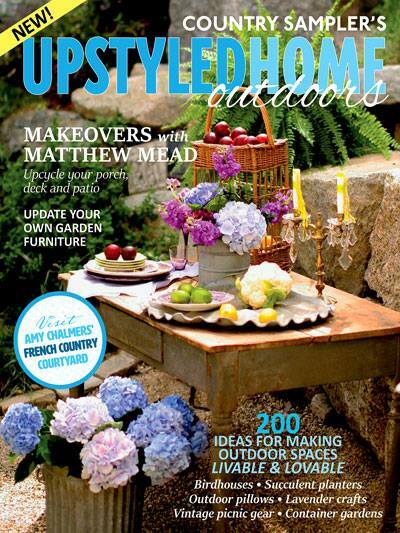 My centerpiece is an antique garden trug that Matthew Mead gifted me. 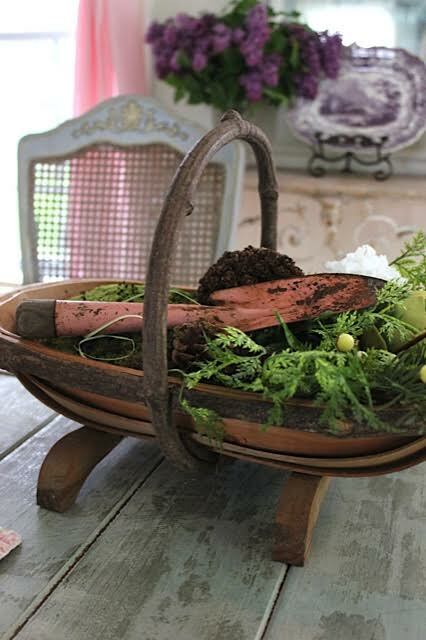 I placed a pink gardening shovel in the trug that I found on our trip to Long Island. The shovel was about the only pink thing for sale at the White Flower Farmhouse shop. and the lightheartedness these months bring to our daily living. summer breezes. Centerpieces will be made up with cuttings from the garden pink roses. 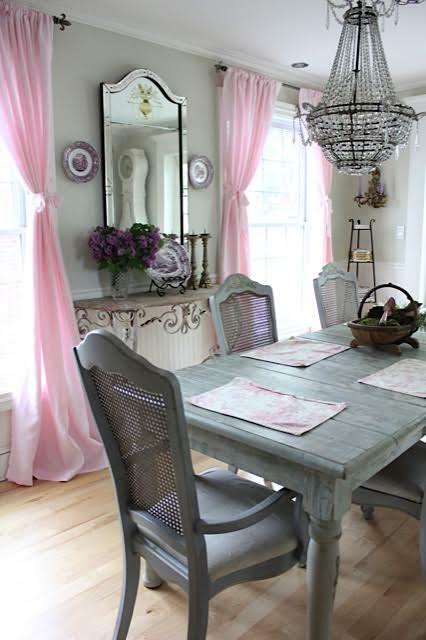 but until then, we will be in full spring and summer mode, here at Maison Decor. 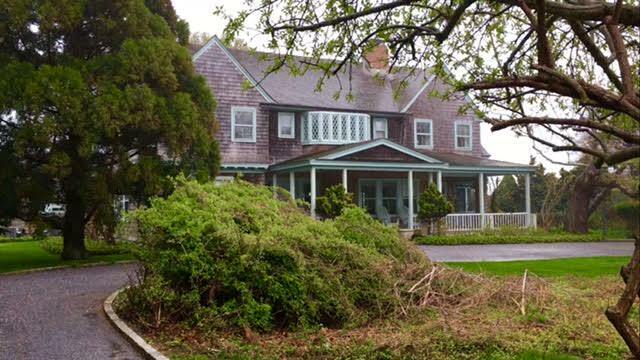 Once upon a time, there was a beautiful mansion built in the Hamptons called Grey Gardens. 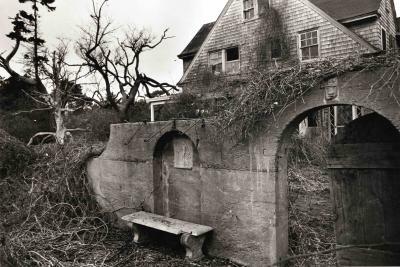 Grey Gardens got its name from the cement garden walls, the color of the dunes and the sea mist. Grey Gardens would become notorious for its eccentric mother and daughter inhabitants, Big Edie and Little Edie Beale, after a series of twists and turns, brought them cult status and notoriety. A reverse story of riches to rags with celebrity relatives always makes for a great tale. 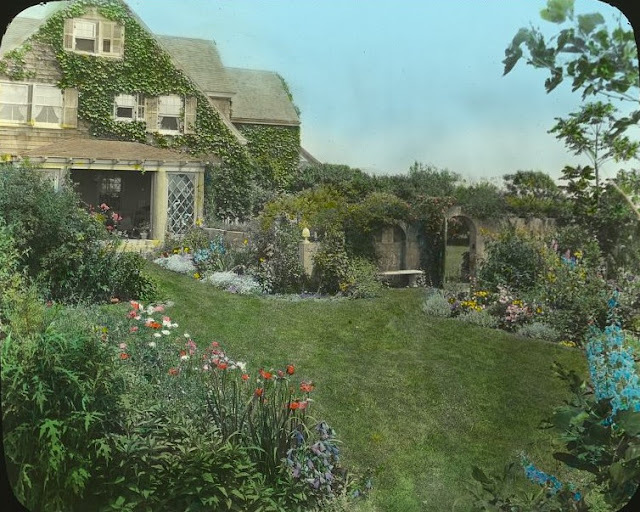 A14 room shingle style Victorian home, Grey Gardens was designed by architect Joseph Greenleaf Thorp in 1897. Acquired by Mr. and Mrs. Robert C. Hill in 1913, Mrs. Hill designed the lush gardens that were once considered to be one of the most beautiful private gardens, with a private cement walled garden room. The home was purchased by Edith Bouvier Beale in the1920s. Edith was a Bouvier, the same Bouvier family as Jacqueline Bouvier Kennedy Onassis, and was an aunt to Jackie. Edith's only daughter, little Edie, was Jackie's older cousin. as the daughters of the rich and privileged Bouvier family. 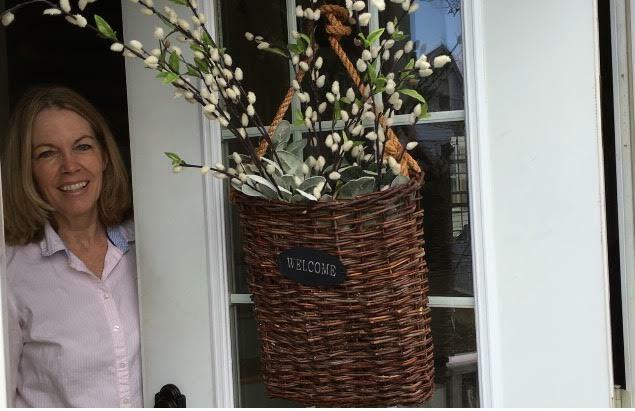 In the HBO movie Jackie Onassis is seen in shock when she visits the house. She called upon her aunt Edie, after she heard the house was to be condemned. Together they enter the walled garden to sit outside, as the stench inside is too much to bear. 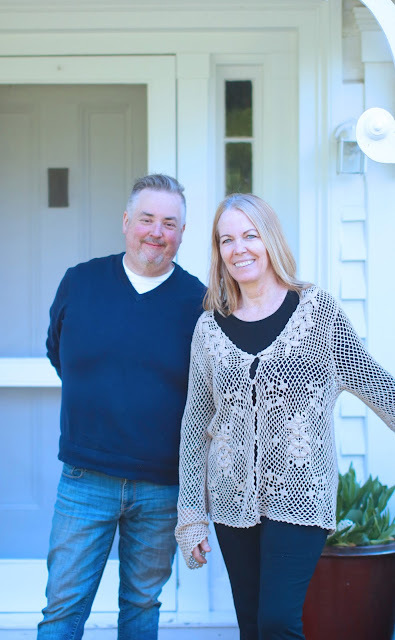 Their story is one I only just discovered on my trip to the Hamptons with Matthew Mead. He asked me if I wanted to see the fabled, Grey Gardens? How had I never heard of this story? He told me about the odd mother and daughter duo who lived in this decaying home. The husband left the mother and his daughter, and they lived for years on a modest stipend. 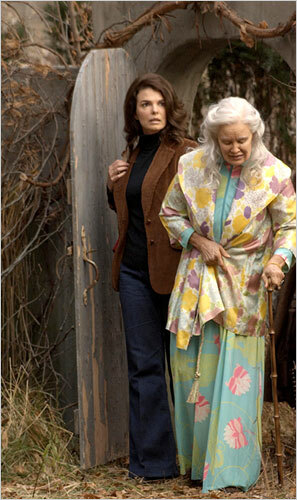 "beautiful Grey Gardens". 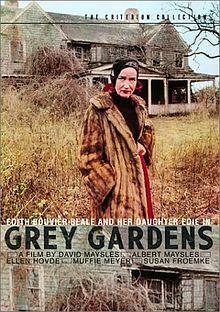 I was hooked, yes I wanted to see Grey Gardens! and raccoons who shared the home with the Beales. and was granted the condition that the two Edies could remain in their home. for food and other necessities as time went along. But they seemingly remained cheerful. Interestingly, the Beales lived there as if there was nothing to be ashamed of. They had created their own little world inside Grey Gardens, and it was all that mattered. 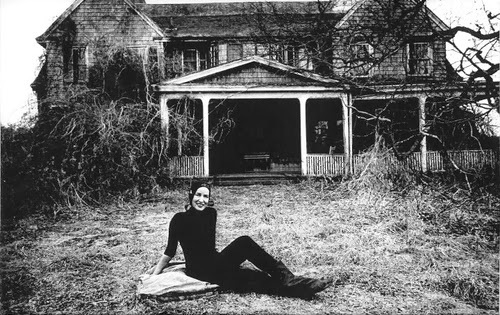 her behind the closed doors of Grey Gardens. They both were dramatic characters, as you watch them in their documentary film, filmed in 1973 by the Maysles brothers, and released in 1975. Mother wanted to be a stage singer, and Little Edie wanted to be an actress or a dancer. The documentary made them into cult heroines. and dancing around the house. Watching cats pee behind Mrs. Beale's large oil portrait, was simply incomprehensible yet irresistible to watch. Much like watching a car wreck, one can't turn away. (The Beales themselves loved the documentary, when shown to them in their home. the past and reminiscing, often opposing each other's versions of their storybook beginnings. 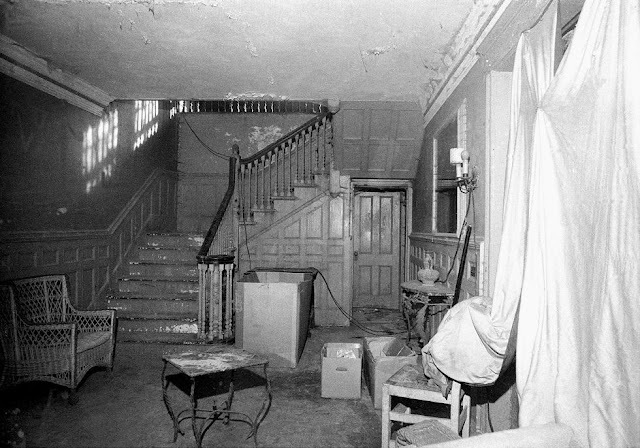 the staircase to a broadway tune, or big Edie carefully negotiating the steps with her cane all dressed up in her silk slippers and fancy dress as she came down from her bedroom to entertain family members for her 80th birthday party in the decrepit dining room. The chairs were too dirty to sit on, so little Edie dutifully put down sheets of newspapers as cushions so everyone could sit. It was surreal and unnerving to watch. 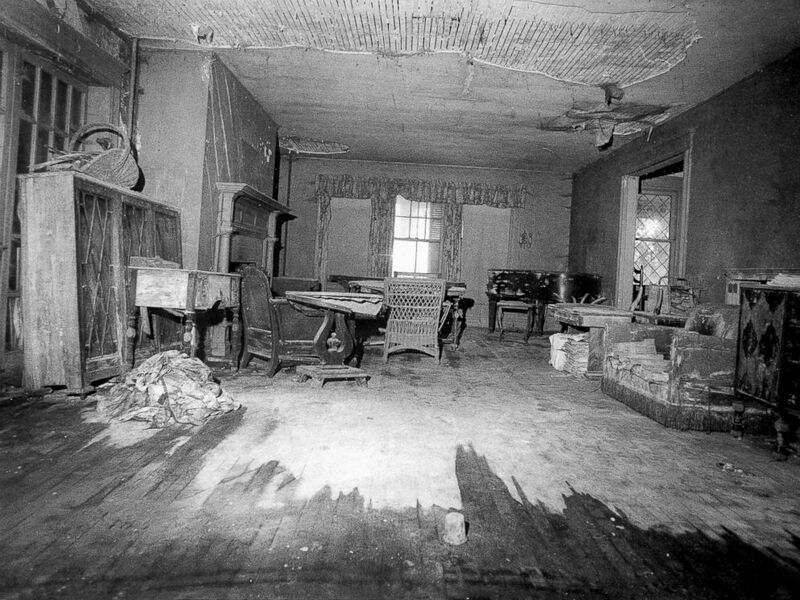 Fast forward, two years after the documentary: Big Edie died after a fall in the house. Little Edie decided to sell the house, leaving all of the contents in place. She simply walked away from her life with "mother darling" after accepting $220,000 from Ben Bradlee and his wife Sally Quinn, of the Washington Post. 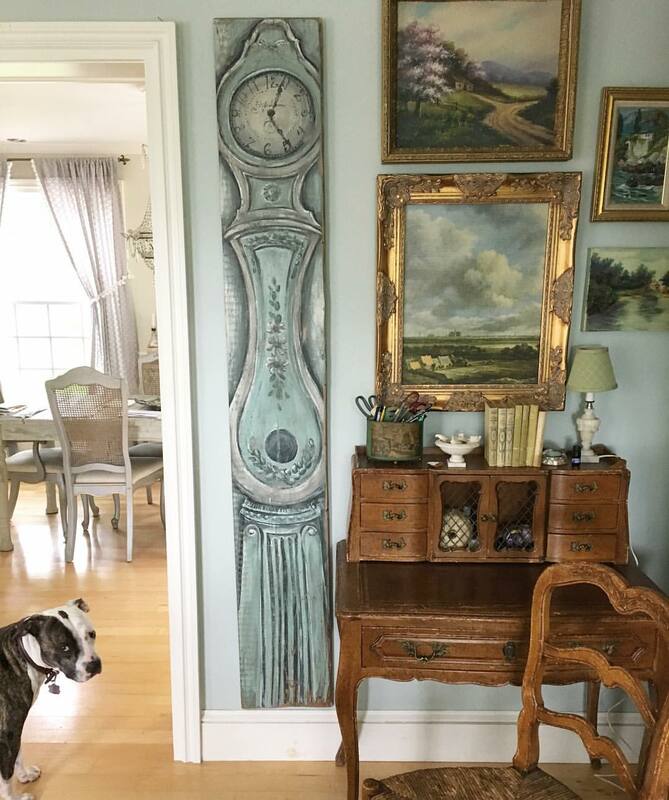 The Bradlees restored the home to its former glory, much in part because of Sally's obsession to save it and restore it as historically as she was able. Sally found a treasure trove in the attic and used the bits of wallpaper and fabrics and antiques to piece together the restoration. Recently Sally sold Grey Gardens for 20 Million dollars after the death of her husband. I'd like to think she was the perfect owner, and enjoyed the time she spent living in the home of the two Edies. until her death at age 84 from an apparent heart attack. 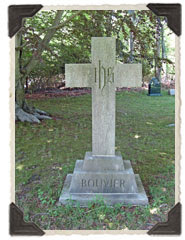 She did not want to be buried with her mother, and after cremation was memorialized with a marker in Long Island next to her brother's grave site at a different cemetary. the family that for the most part turned their backs on her for her irreverent style and eccentric ways. Big Edie's own father disinherited her after she appeared in an outlandish costume at her son's wedding, causing embarrassment for the family. Theirs was a complicated family storyline, and this house held many secrets. 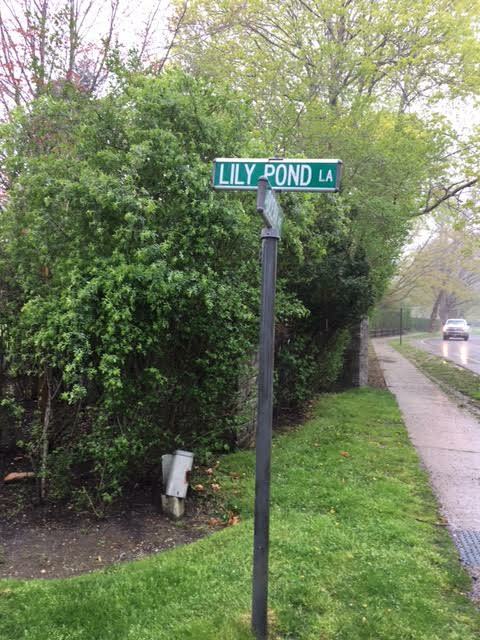 On this rainy and raw spring day, Matthew Mead and I slowly approached Grey Gardens, parked the car and took a stroll in front of the infamous Grey Gardens. Despite the pouring rain, I wanted a closer look. The wind was blowing in from the ocean grabbing at my umbrella. I tried to imagine what it used to look like in it's state of disrepair. The heavy gnarled limbs of brush out by the front of the road seemed original to the landscape, and perhaps were left in place as a nod to the Beales residency and the original plantings. You can see more on our video at the bottom of the post. We walked along the front of the property to the other end of the circular drive. 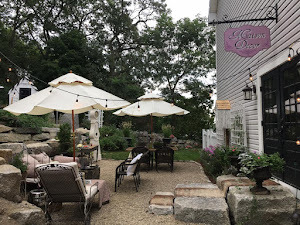 I headed towards the house just a bit, and Matthew mentioned the bay window on the second floor was what little Edie referred to as the "eye to the world". I was intrigued, and planned to watch both the documentary and the 2009 HBO movie when I got back home. There has always been an interest on my part of who originally lived in these grand old homes. 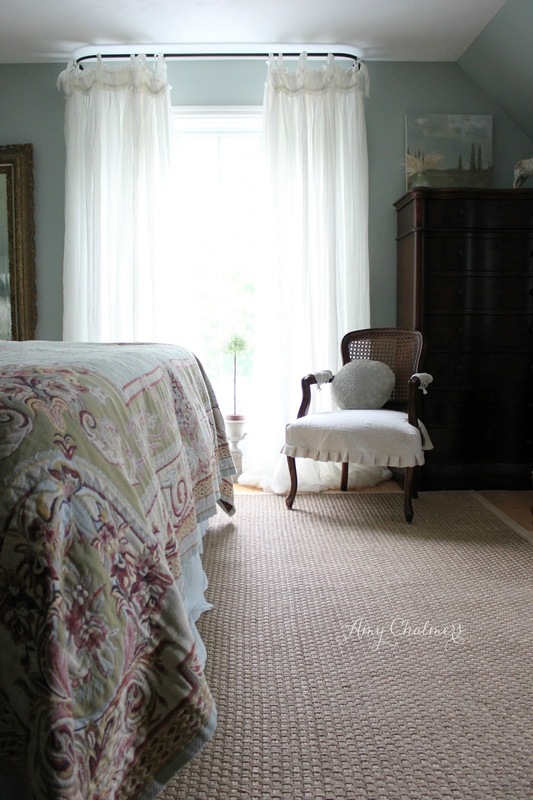 When I purchased an 1881 shingle style victorian, I researched the owner and even visited her grave to see what more I could glean, and to pay my respects. This elegant old house with its crazy story had taken me in it's hold, I had to find out more! is where you will find Grey Gardens, at 3 West End Road. It holds the memories of a bittersweet life. 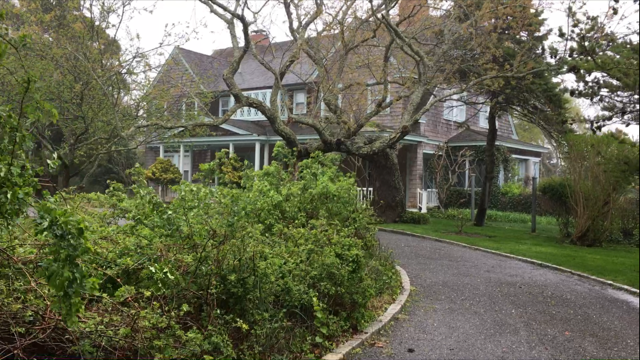 Watch the short video of my recent trip to Grey Gardens with Matthew Mead. you won't be able to sleep for a few nights after watching. 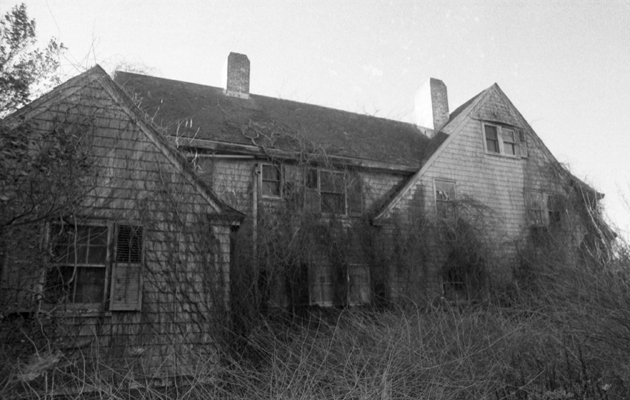 if you haven't already heard the story of the Beales and their beloved Grey Gardens. the first time, which is a new feature on FB that has you showing what you are doing in real time. the Live part of the video experience so fun! When Matthew and I get together we often have conversations about his early career, that I find particularly fascinating. And so one of our FB Live videos was centered on his first trip to the Hamptons and how he came to be in this circle of visionary designers. Now it would be my first trip to his career beginning stomping grounds, and what made it all the more sweet, was the opportunity to be staying at the iconic home of designer Tricia Foley. pic I took of her dining room when we arrived at her home. as has Ralph Lauren and many other notables. 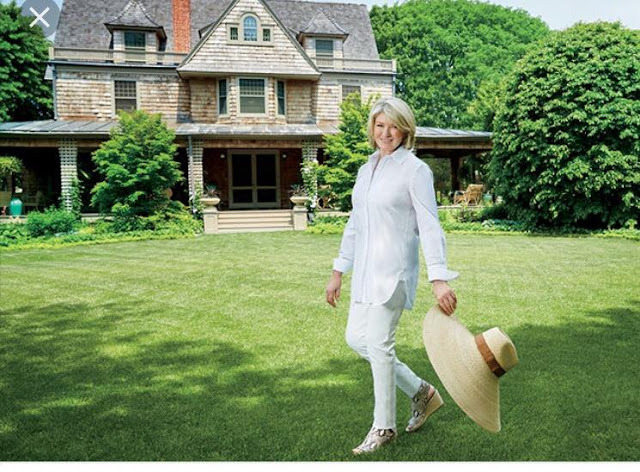 Here is Martha in front of her "beach home" in East Hampton. 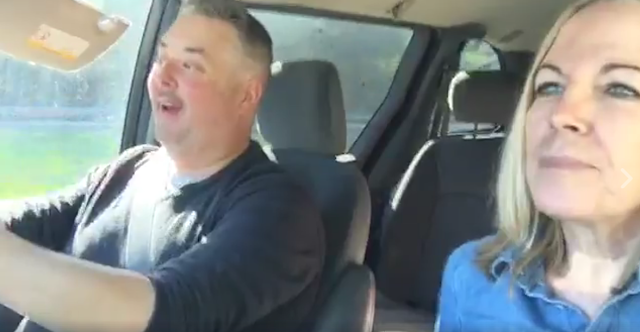 We would be doing a drive by and checking out her place on our last day in NY. She looks amazing, doesn't she? Would we get a chance to see her for ourselves? Would she remember the day she invited Matthew to come here and meet with him? 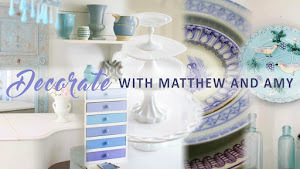 That is one epic story that Matthew has shared on our Decorating Video channel. Martha gave him a personal tour of this home!! 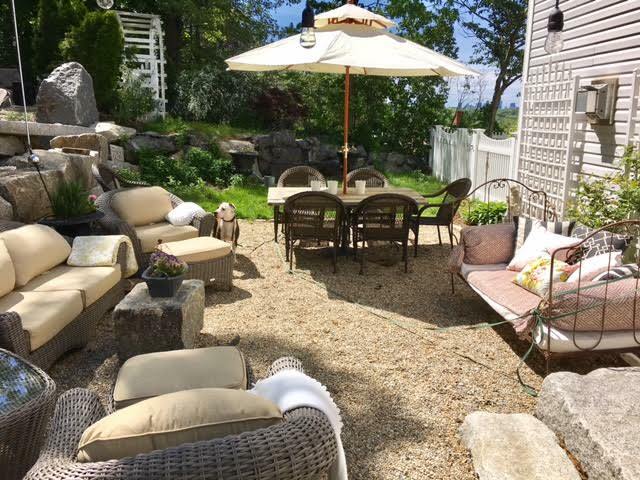 posts with more from Long Island and the Hamptons!